Tomorrow, Tuesday April 14th 2015, is Ben & Jerry’s Free Cone day from 12 – 8pm. 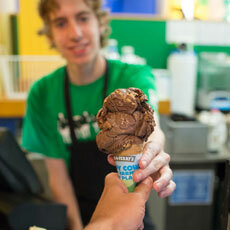 Prepare to wait on a line outside any Ben & Jerry’s shop to grab your free ice cream cone. Use the store locator below to find the store nearest you. Enter your location details in the interactive map below to find the nearest participating Ben & Jerry’s.